Fun men are serious about Bathinda. Apart from people from power, gas and refinery, these men from the entertainment sector would also be giving the much-needed impetus to the socio-economic development of Bathinda, also known as the backwaters of Punjab. Commerce would, of course, not be immaterial to them. But, they would also generate job avenues for the youths of the region. 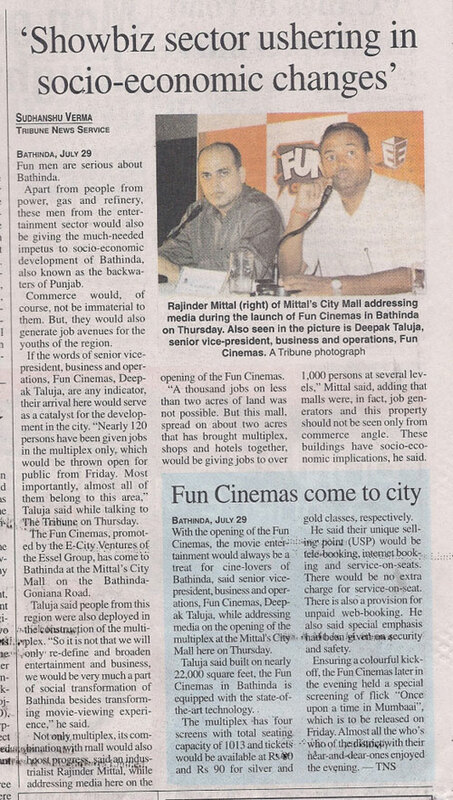 If the words of senior vice president, business, and operations, Fun Cinemas, Deepak Taluja, are any indicator, their arrival here would serve as a catalyst for the development in the city. “Nearly 120 persons have been given jobs in the multiplex only, which would be thrown open for public on Friday. Most importantly, almost all of them belong to this area.” Taluja said while talking to The Tribune on Thursday. The Fun Cinemas, promoted by the E-city Ventures of the Essel Group, has come to Bathinda at the Mittal’s City Mall on the Bathinda Goniana road.